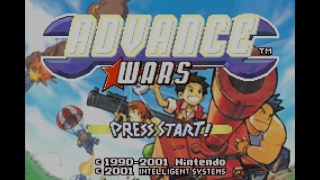 Advance Wars is a tactical strategy title that was originally released for the Gameboy Advance during the turn of the new millennium. You start off as an unknown recruit during the first 13 missions which serve as a tutorial showing you how to play the game. After that you unlock the campaign mode and choose one of three CO's to lead your battalions. Each CO has unique abilities that can help out in a pinch. There are many different units in Advance Wars each with their own movement patterns, attack power, and tactical advantages over certain units requiring you to think before you act. Another strategy is to capture enemy cities allowing you to earn money and deploy new units. The campaign is impressive in-terms of both content and length so don't expect to finish the campaign in just a few sessions. Other modes include versus and can be played single player or with some friends! 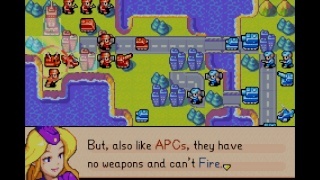 Unlike the other GBA launch titles on the eshop you can play multiplayer in Advance Wars, but you will have to pass a single controller around to accomplish this which isn't ideal though it is better than nothing. 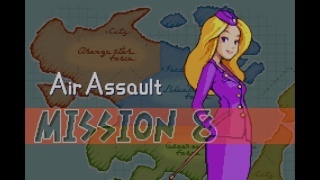 The stages and character sprites have aged nicely in Advance Wars and look surprisingly well given the age of the game. Pixelation is minimal even without using the visual options in the Virtual Console menu. The short battle sequences look impressive, but they are somewhat lenthy so turning them off might be a good idea for impatient players. On an audio standpoint the game sounds superb with a wide variety of different sound effects and a rocking soundtrack. Final Verdict Advance Wars is a game that shines in almost every facet and the few flaws it does have are hardly worth mentioning. If you enjoy a challenging strategy title you might be disappointed, but if you like a fun lighthearted strategy title that will keep you entertained for hours then you should download this charming game! Thanks for reviewing Advance Wars! Keep up the hard work dude. It's awesome that we're finally seeing new virtual console games that weren't released on the Wii virtual console! I will download em' all! @SuperVash wrote: It's awesome that we're finally seeing new virtual console games that weren't released on the Wii virtual console! I will download em' all! Let's hope that this will improve the third party support we've been seeing for the service 'or rather the lack thereof'. I used to have Advance Wars 2 and played the heck out of it, but is Advance Wars 1 as good? This is such a detailed and beautiful review! This is part of the Famicom Wars series? Rukiafan wrote: This is part of the Famicom Wars series? I can't beat this game, but it's a blast to play. @Marioman18 wrote: I used to have Advance Wars 2 and played the heck out of it, but is Advance Wars 1 as good? There might be a few less options but it's still the same great gameplay. If you liked the second you can go wrong with the first! I was not a big Battalion Wars fan but I really hope there is an Avance Wars announcement. It might even be out quickly as the 3ds games seem to be much easier to make. I still remember the bombshell that was Mario and Luigi last year! It's hard to stop playing this game once you get past the training mode portion of the campaign.